This is not an optical illusion; we changed the task. Cody wanted to make the Sudoku more evil. Have you joined a Shenanigans Team yet? If not, you may still add your name to the list of people who want to play, and get put on a team! When you are on a team, you are eligible to earn Team Points by completing this Fallen Letters task (and get some Beans for yourself, too). 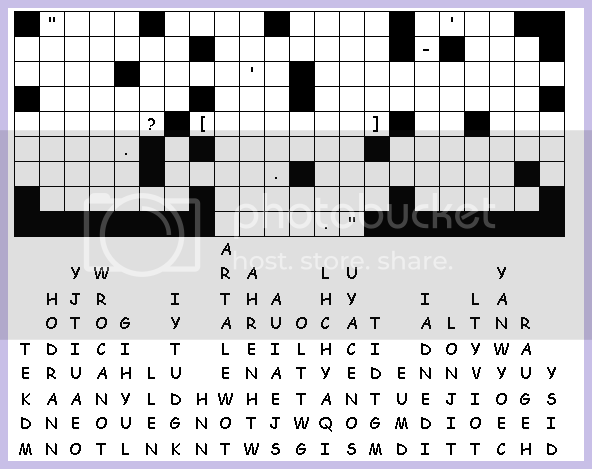 Finish the puzzle and send me a PM telling me what it says. Title your PM with your team's name (ie Team PINK or Team PURPLE) - Fallen Letters. Your team will receive 5 Team Points when you complete it and send it in and you will receive 10 Beans. Last edited by Prof. Tarma Amelia Black on Sat Feb 13, 2016 2:37 am, edited 11 times in total. You have a trifle over 24 hours to send in your answer to this puzzle. Last edited by Prof. Tarma Amelia Black on Fri Feb 12, 2016 8:33 am, edited 1 time in total.